Great to see you coming around. I started to notice it in that Houston series when you came up to bat, you just seem to look so much more confident, kinda like you have this look in your eyes that says “Alright meat, show me that weak a** sh**” haha! Those were spectacular plays you made in Philly!! I jumped out of my seat when you took away that homer! I’m stationed in Korea and I have been staying up all night just to see ya’ll play. Cant wait to get back to the states in Sep for a little while and see some games in STL! Your right, Dunc will be missed. I never had anything against him, he was just having a tough go. He played hard and never complained. I think we all wish him the best though. Keep it up! I’ll keep on choosing to watch games over sleep any day!!! You’ve been playing great lately, Rick. I’m excited about an outfield of Holliday, you, and Luddy. Just wanted to let you know I hope you have a good series against the Dodgers and that I really enjoy reading the blog. Great Job, Rick! I was sitting on my couch watching you hit single after single, going “Where’s all the doubters now! ?” We knew you had it in you, glad to hear you shoulder is feeling better and I must laugh as I’m sure you did about all the people giving you swing advice. There’s a reason you are where you are, show them what that reason is. Good luck with the Dodgers, GO CARDS! I’m so glad to see that you are finding your groove again. It’s great to have you silence the non-believers. Keep up the good work! It’s good to hear that your shoulder is doing better, they say time heals everything. Congrats on your wine!! I’m hoping to purchase a bottle for my collection. Randy Wolf’s stats have to change vs left-hand hitters! Rick, you look a lot more comfortable and you have been right-on with bat contact. We are all hoping you keep it up! its great to see you healthy and playin good every time you do something good i jump out of my set:] keep it up and good luck with the dodgers and games to come! This lineup now has no easy outs. It’s a real treat to watch. And thanks to you, personally, for playing the game the right way and not being a hot dog jerk like Alphonso Soriano. Glad to hear you are feeling better and batting better. Will be at the game tonight against the Dogers. Another thing why don’t you post a picture of your dogs. I have two siberian huskies myself. They are both wonderful dogs. One is AKC and the other one was given to me. I would never trade them for the world. Keep up the good work that you and all the other Cardinals have going for you this year. I realize that in many ways you’re just a guy like me, and I don’t believe in hero worship, but I do believe in giving credit where it’s due. For me your story is surely one of the most inspiring in all of sports. Even more than outstanding physical talent, it seems to me that what sets you apart from a vast majority of athletes is your combination of grit, determination, humility and a positive attitude. Most men do not have that kind of mettle, and certainly not from age 21. Things do not always turn out like we expect, but show me a guy who can put his ego in his pocket and be all heart when he’s fallen from grace and the whole world is shouting at him, and I’ll show you a guy who has absolutely nothing to fear from some run-of-the-mill hitting slump. How could every single guy in the clubhouse not be better off having a teammate like that? One good week isn’t a reason to declare victory, obviously, but I can honestly say I never doubted you’d come back around. Hopefully Mozeliak and DeWitt have enough sense to keep you around for the much better days you obviously have coming. Heartening to know the same world that gives us guys like Ryan Leaf can also manage at least one Rick Ankiel. If there is a better reason than that for young boys to watch baseball, right now I can’t think of it. We miss you when you are not in the line up, Rick. Hope you are better soon. We, too, rescue homeless cats and dogs and find good homes for them. They are helpless without people to take care of them, and thank God there are people like you and your wife. Sorry Chris Duncan is gone, too. Always wanted to see him do well. Hope you like your new team mates. They are really contributing! Love the Blog, great stuff, thanks for sharing this great . I have been a fan since you joined the Cardinals and was really happy to see you make your way back as an outfielder (with one of the best cannons in the game). However, after reading about what you (and your wife) do to support stray pets, my wife and I will be fans for life, and she is an ASTROS FAN!!! We adopted two Siberian huskies ourselves, about 6 years ago, and they are a big part of our lives too. We will definitely order a bottle of the Cabernet to support the cause. My wife and I (and our huskies) are currently working and living in the UK, but I rarely miss a Cardinals’ game (MLBTV). I am glad to see your shoulder is getting better and hope you get back to 100% soon, you are definitely an asset to the team and you have a lot of fans (even an Astros supporter). Later, Tony. Love the Blog, great stuff, thanks for sharing. I have been a fan since you joined the Cardinals and was really happy to see you make your way back as an outfielder (with one of the best cannons in the game). However, after reading about what you (and your wife) do to support stray pets, my wife and I will be fans for life, and she is an ASTROS FAN!!! 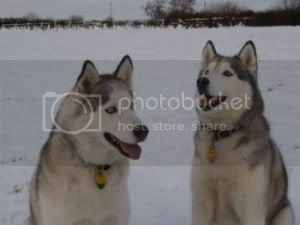 We adopted two Siberian huskies ourselves (Yukon & Dakota), about 6 years ago, and they are a big part of our lives too. We will definitely order a bottle of the Cabernet to support the cause. My wife and I (and our huskies) are currently working and living in the UK, but I rarely miss a Cardinals’ game (MLBTV). I am glad to see your shoulder is getting better and hope you get back to 100% soon, you are definitely an asset to the team and you have a lot of fans (even an Astros supporter). It’s nice to see that you are hitting better… it’s was awesome last week, when you hit a solo shot against the Phillies, I just got off a plane to Hawaii, and was in the hotel, and when I heard about the single, I found it out on a blackberry while waiting in honolulu for 4 hours… keep it up, good to know your shoulder’s getting better. Also, good to know you help out charity, shows you do more than just play baseball… huskies rule, I wish I had one, I had a bulldog, but he died around 2 from epilipsy. Please don’t become a free agent next year. Thanks for writing the blog, Rick. It doesn’t seem like you guys would have a lot of free time during the season, so it is much appreciated. Congratulations on bringing in the go-ahead run last night! It is just fantastic seeing you turn things around. Hey, do you actually take the train to the stadium in NYC? I figured you had a team bus or something that took you all there together. Can you make a white wine for your charity? I would love to buy a bottle to support your charity, but red gives me migraines. I have 8 Border Collies and a Bichon Frise. My whole family is about as dog crazy as they come. I believe strongly that since we, as a society, domesticated dogs and cats and made them dependent upon us, we are obligated to care for them and treat them humanely. Thank you for doing your part as a dog owner and for the charity. Holliday, Ludwick, and now that you have turned things around (hopefully for good), the Cards may have the best outfield in baseball. And with Rasmus on the bench, we have a productive one who can go in when someone needs a break. Cards are on a roll! Rick, great homestand. I’m glad to see your adjustments paying off at the plate. I have to tell you, you are easily my favorite Cardinals story and every time you get a big hit or make a spectacular catch, it brings a tear to my eye. I’m so glad you have you on this team. Keep it up, Rick. You are the man. I get mad when you are not in the lineup, but I don’t want you to play hurt. I’m not a drinker, but congrats on the wine. Stray Rescue is a great cause. Randy is a special guy. I hope to see you on the team next season and at the Warm Up in January. I’m tired of screaming at J-mo. Mustache, beard with or without-doesn’t matter. Just be Rick. You’ll be fine. Can I see your Ronald McDonald fett at Warm Up? Iagree with all of the comments readespecially(morganotron) when you and J.D. drew hadyour 1st.year with the cards I thought both of you would have your numbers retired if you had a long tenure and stayed healthy.hope at least one of you makes it . A cards fan since 1943 saw RED LEAVE BUT COME BACK TO MHAVE HIS NUMBER RETIRED. Good luck for the rest of this season and many more. Have you seen what Brett Wallace has been doing at Sacramento since the Holliday trade? I say unless the Cardinals win the world series and re-sign him then the move wasn’t that smart.. Because Wallace is going to be an outstanding major league baseball player!! And Clay Mortensen is good too. Am in agreement with many of these comments. The lineup’s always better with you in it. In fact the 6th spot seems to be a good mix with Holliday, Ludwick, DeRosa, Puhols and all the Cardinals. Congrats on such a great charity, helping animals and Cabernet as the fundraiser – yum, a great choice of wine which should be popular with many. I know the cardinals have too many outfielder. I think the shoulder is still bothering you. Hope it finnally heals and the cardials resign you. I think you are the best defensive outfielder we have and hopefully the offence will come around. Is there any way you can send me the email address of the cardinals and the mail address of the broadcasting booth? take care and come back next year strong with the bat and shoulder okay.